I am very happy to report that seabreeze is predicting sunshine for the whole of the weekend!!! What a nice change. The water this morning looks like a mirror. A glass out. It would be nice if it is like that tomorrow morning. We are planning on going to slay some fishies. It’s been way too long (a few weeks). One point of concern that sticks in my mind are the pod of Orcas (killer whales) that beached themselves only a little bit further North up the Queensland Coast this week. They are way further North than they should be, chasing the migrating humpback whales. Such beautiful creatures, and it would be amazing to see them, but they are also the top of the food chain. Lets just hope they don’t mistake us for seals (and their lunch). Have a great weekend everyone. 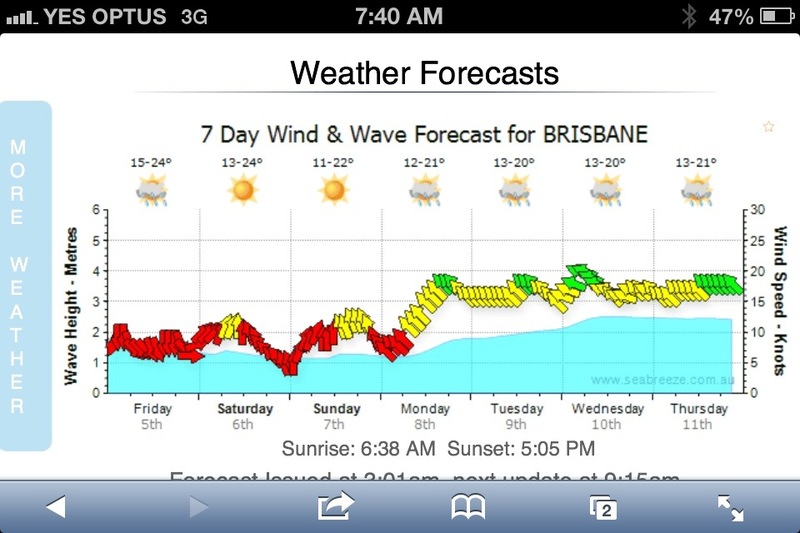 If you’re in Brisbane, I hope you get out and enjoy the amazing weather ahead. Sunshine, glorious sunshine! I can’t get enough of it, i’m actually excited to get some washing out on the lifelines this weekend. Have fun slaying fishies, don’t forget your wet suits 😉 As for the killer whales i’m not sure what the best defensive strategy is so i’d go for the one you use with bears, drop into fetal position and stay very still. Have a great weekend!